»GE Crops»Which Crops are Genetically Engineered? Which Crops are Genetically Engineered? The Grocery Manufacturers Association has estimated that 70-80% of the foods we consume in the US have some ingredients from crops that have been genetically engineered (GE)*. The natural assumption is that a majority of the food crops in the US must also be GE varieties. It turns out that very few GE crops are grown, but some are grown on very large areas and their ingredients are used in many food products and beverages. There are only eight commercial GE crops grown in the US. They include corn, soybean, papaya, sugar beet, cotton, alfalfa, canola and squash. While other crops have been commercialized at one time and withdrawn or authorized for release but never marketed, it is this small core of GE crops that are being farmed in the US. Wheat, rice, tomatoes, potatoes and many other vegetables are often incorrectly reported to have GE varieties in the marketplace; for now this is not the case, and we should be familiar with those eight that are actually grown. In 2014, 93% of all corn grown in the US was GE, 94% of the soybean crop was GE, and 96% of all cotton grown was GE. Their combined 175 million acres was about 43% of US cropland according to the 2012 Survey of Agriculture. 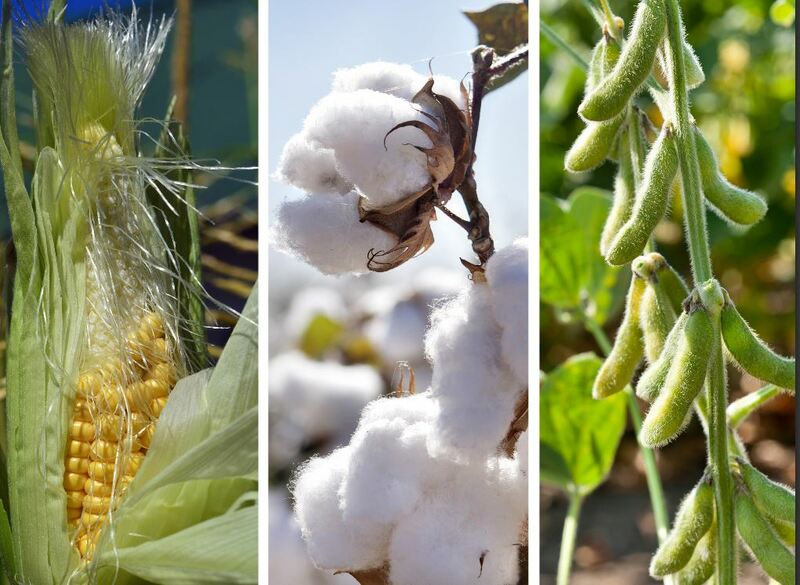 These three crops dominate the GE crop market, and it is the numerous ingredients and extracts from corn and soybean that are used with other foods and beverages that largely accounts for the 70-80% of our food having some GE components. Almost all of the GE corn is grown for animal feed, biofuel or other food processing and industrial applications. There is also a small market presence of insect resistant GE sweet corn though data on its acreage is difficult of find. Here in Hawaii, most of us are aware that one of our favorite fruits, the papaya, was the first GE fruit to be commercialized in the US, and today we are able to enjoy it from the store or from our backyard thanks to the combined efforts of Cornell University and University of Hawaii researchers led by Dr. Dennis Gonsalves. 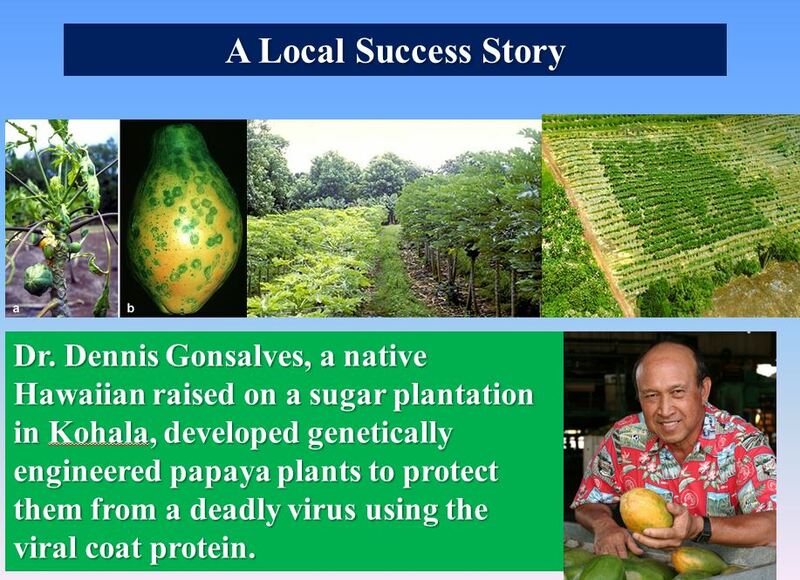 Having grown up in Hawaii, he knew the importance of papaya and the devastation the ring spot virus disease would bring as it was moving from Oahu to the Big Island. He and his collaborators were successful in breeding GE varieties that were resistant saving the industry from disappearing. The most recent data indicate that the Rainbow GE variety accounts for 76% of the papaya acreage in Hawaii. 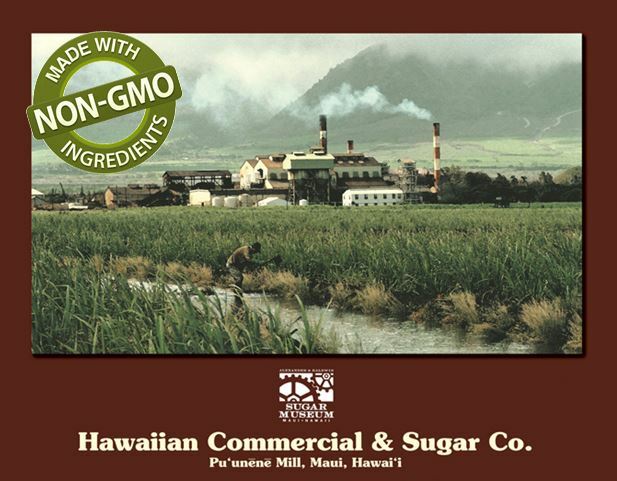 The majority of this is on the Big Island, and these GE varieties also allow its farming and gardening to continue on Oahu and Maui where the virus is also present. Sugar has a long history of use, and like corn and soybean is added to many foods and beverages. Sugarcane was one of the ‘canoe plants’ that Polynesians brought with them some 1,000 years ago in their ocean voyages to Hawaii. The other sugar source, grown in temperate regions, is the sugar beet. Today, the amounts produced in the US are about the same for cane and beet sugar. One characteristic that separates them is that there are no GE sugarcane varieties being farmed, while 95% of the sugar beets grown are herbicide tolerant GE varieties. Therefore, about half of our sugar is from GE plants, half from non-GE plants. However, after processing it all ends up as the identical product sucrose, and analytical chemistry would not be able to determine the source. There are no proteins, genes or DNA left, just sucrose. Sweet! 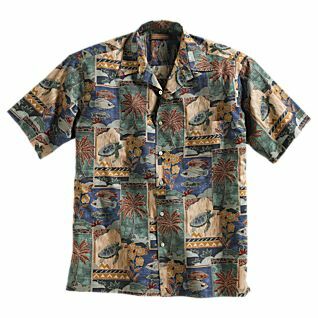 Cotton of course is worn by many of us, and as noted above almost all of it grown in the US is from GE varieties. A little more than half of the cotton fiber produced is converted into apparel, more than a third into home furnishings and the remainder into industrial products. Besides the fiber component, the seed is used for animal feed and is processed for oil used in cooking or salad oil, shortening and margarine. Limited quantities also go into soaps, pharmaceuticals, cosmetics, textile finishes and other products. Adoption of GE cotton by US farmers has led to greatly reduced insecticide use. 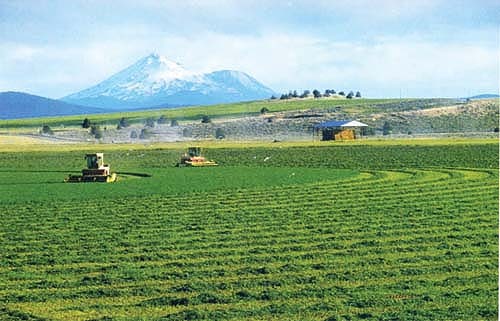 Alfalfa is grown on about 20 million acres, a hay crop with production closely tied to the dairy sector. Herbicide tolerant GE alfalfa was originally approved in 2005, then taken off the market by a legal injunction, and finally approved in 2011 after 4 years of an Environmental Impact Study by USDA. According to UC Biotech, the GE alfalfa adoption was 25% of the 2014 acreage. A popular farm journal thinks the sales of GE seed for new plantings are more substantial. A second GE trait in alfalfa (with the introduced gene coming from alfalfa itself) near commercialization is a low lignin variety with increased digestibility as an animal feed. In addition to papaya and sweet corn, the other GE whole food available in the US is squash. Resistance to three plant viruses through genetic engineering has been breed into yellow straightneck, yellow crookneck and green zucchini squash and it is produced for human and animal consumption. Data on percentage of GE squash in the US is limited, with a 2006 report indicating it was 13% of the squash acreage, and in 2013 this percentage remains about the same. 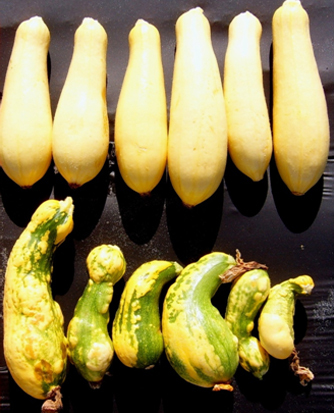 The total acreage for summer squash in 2013 was about 43,600 acres. In the United States, canola is grown on about 1.5 million acres, with a GE adoption rate of the herbicide tolerant types at 93%. Much more of it, again almost all GE, is grown in Canada with the US its leading importer. Canola oil is used in frying and baking applications, and is an ingredient in salad dressings, margarine, and a variety of other products. Canola meal is primarily fed to cattle and pigs. These eight GE food and feed crops are the only ones farmed in the US; three are whole foods (papaya, squash and sweet corn) and the others (soybean, corn, cotton, canola and sugar beet) are processed and added to many other foods and they are fed to animals. As with processed GE sugar beet ending up as sucrose, the extracted oils from the GE varieties of soybean, corn, cotton and canola do not contain the protein products, genes or DNA from their host plant; the refining process eliminates detection of the oils’ plant breeding history, leaving just the oil. Related topics soon to be covered will include a closer look at the utilization of the big three (corn, soybean and cotton) around the globe and GE crops in the pipeline. * The term genetically modified often is used interchangeably with genetically engineered. The more accurate description is used here, where genetic modification refers to a range of methods to change the genetic makeup of a plant, through random mutation, hybridization, intentional mutagenesis or by other means. Genetic engineering is one type of genetic modification that involves the insertion of genetic material through recombinant DNA methods that allow a gene from any species to be inserted and expressed in a food crop or food product. (National Academy of Sciences, Safety of GE Foods).